Cycling is the repeated cyclic variation in the output of a (thermal) plant. It affects the life, and operation and maintenance costs of the plant. Therefore, it is important to understand cycling of thermal power plants. There are two main causes of thermal plant cycling. • Demand variation– Everything is produced to meet demand of the consumers. Power generation is no exception. Power demand has a daily, weekly, and annual variation pattern. Specifically, the daily variation pattern is most significant. Economy of operation demands that power producers to adjust their output dynamically to follow the demand. The plant output increases and decreases as the demand increases or decreases by the hour. That is power plant cycling. Basically, it the cycling of output power of a plant. • Integration with Renewables– Another factor which necessitates cycling of thermal plant output is the hybridization with renewable sources like wind and solar. Wind and solar sources, though very desirable as green sources, are notoriously intermittent and unreliable. But when they become available, power output of the thermal plant must be reduced in response, and when they go out, the thermal plant must rise to the occasion. Thus, the integration of renewable sources like solar and wind with a thermal power plant, although beneficial in an overall sense, adds to the cycling of the thermal plant. Go to the power plug which powers the refrigerator in your home, and turn the switch off. Then switch it on. Repeat this process three times in the presence of your wife and see how she shouts! This fact is known even to housewives that cycling a simple device like a switch is more likely to fail if cycled more often. Of course, the refrigerator is at a far greater risk. 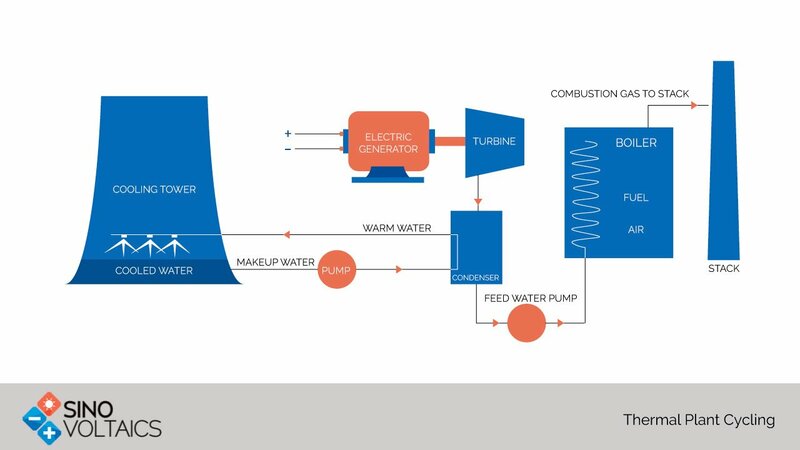 When complex systems like thermal power plants are cycled on and off all heat related components plants including the turbine, boilers, steam pipes and auxiliary components cycle through temperature extremes. The result is creep-fatigue which reduces reliable life of the components. This damage may not show up immediately as a catastrophic failure. It is gradual and cumulative. It may show up ultimately as premature failures of these components. Some components may demand more repair and maintenance, others may simply fail catastrophically, or fail safety tests. An obvious result is the increase in number of outages, and a heavy increase in operation and maintenance costs. Some experts believe the cycling cost can be as high as 7% of the total system cost. Studies by NREL and other reputed agencies have found that O&M costs of power plants may currently be increasing at a rate higher than for inflation. Further, they opine that a significant root cause of this rise for many fossil-supplied units is the cycling which has been enhanced by the integration of (intermittently available) solar and wind power. What happens if one does not follow the demand, but maintains a constant output? Obviously, the utility must meet peak demands. Then the power output will be surplus when the demand is low. That is a wastage. The manager has to weigh the cost of cycling against the cost of unused production. It looks obvious that development of a large-scale and economic mode of energy storage will allow us to store surplus energy so we can use it when the demand rises. This will help keep the plant running and reduce the extent of cycling.